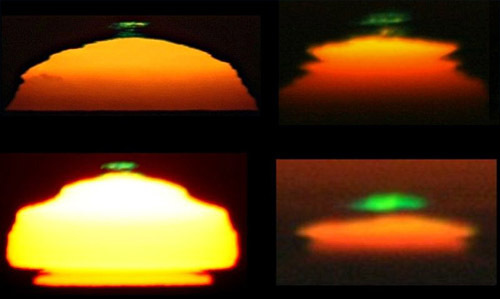 Is there really such a thing as a “green flash” at sunset and sunrise? While the Green Flash may sound like a lesser cousin to comic book heroes the Flash or the Green Lantern, it’s actually an atmospheric event that causes a green bar to appear just above the sun as it sets or before it rises. The green flash has captured the imagination of many people. Jules Verne’s 1882 novel The Green Ray follows its heroine who embarks on an adventure in search of the phenomenon. There are also historical figures who have witnessed the event. Famed polar explorer Admiral Byrd claimed to have seen a “green sun” persist for 35 minutes while on an expedition to Antarctica. But what actually causes the green flash? It is the result of the combination of two optical phenomena: a mirage and the dispersion of sunlight. The first ingredient is a mirage. Like the famed desert mirage, the mirages that cause green flashes are the result of sunlight bending on its way to your eye and creating an image of an object somewhere other than its actual location. Dispersion is the second ingredient. When the light bends (or refracts) on its way to your eye, the air acts as a prism to split up the light into its constituent colors. So, first the red light from the sun sets, followed by yellow, green, blue and violet. To the untrained eye, all green flashes may look the same. In fact there are a total of four types: the inferior-mirage flash, the mock-mirage flash, the sub-duct flash and the green ray. Of the four types, the inferior-mirage flash is best understood. The main component is an inferior mirage, called “inferior” because the duplicate image appears below the actual object. You’ve probably seen many, in the form of the hot highway mirage, shimmering on the asphalt on sizzling summer days. Inferior mirages materialize when the layer of air nearest the ground is hotter than the layer above it. When the light from the sky hits the less dense hot air, it bends upward toward your eye instead of continuing on its path to the ground, appearing to the viewer as a glittering pool of water. The mock-mirage green flash is similar to the inferior-mirage flash. It consists of a special kind of superior mirage, the inverse of the inferior mirage. In a superior mirage, the light slows down by traveling through colder air that rests under a region of warmer air. It then produces an image above the actual position of the object. This type of mirage occurs primarily over snow, ice and water. When you see a mock-mirage green flash, you’re viewing the superior mirage of the sun from above the region where the temperatures change. The top bit of the sun appears snipped off and shaded green. Sub-duct flashes are even weirder. They occur when the light from the top and bottom of the sun bends toward the middle, creating what appears as an hourglass shape. As the sun continues to set, the top splits off and turns green. What causes the fourth and final type of green flash – known as a green ray – is still unclear. People who have reported the green ray liken it to a bright green beam shooting up from the sunset. It also lasts much longer that the other flashes. Some speculate that this might be due to aerosols in the air, but the data is inconclusive due to the rarity of the event. Surrounded by trees, buildings or mountains, most folks usually won’t see the sun set, let alone its green ray companion. But, according to Andrew Young, an astronomer and green flash expert at San Diego State University, people have reported green flashes from the top of the Empire State Building in New York City, as well as from airplanes and mountaintops. The key to seeing a green flash is to position yourself so that you have a clear, unobstructed view of the horizon below your eye level. That’s why many green flash sightings occur while looking out over oceans. In the tropics, the green flash may only last a couple of seconds, so if you want yours to last longer, you should head to higher latitudes. Try hiking in the Westfjords of Iceland or in Nome, Alaska. In the winter, fall and spring (it doesn’t get dark in the summer at such high latitudes), it’s possible to see an even more brilliant but unrelated green atmospheric spectacle: the northern lights.